Time is flying by. Leo, my rainbow, is turning ONE in a week. How has this happened? This miracle-of-a-boy who took so long to arrive, whose pregnancy was full of anxiety and fear that made it seem to drag out, even longer than a low-risk pregnancy could feel — he has been here a year! I can hardly believe it. I am so proud of this little guy we have made, so proud of the big, strong one-year-old he is about to become. Tell him to stop growing so fast! While I know those phrases are spoken by friends who mean well, this loss-mama heart falls apart to ever think of him slowing down. Joanna was born 1 pound, 1 ounce. Too small for her gestational age. Joanna slowed down. Joanna’s movements slowed down. Then, she stopped altogether. How could I ever ask for Leo to slow down? How could any mama wish for her baby to slow down? To stop growing. You just can’t wish that, because to continue to grow at the steady rate of standard time is, wouldn’t you say, far better than the alternative? I don’t know any loss moms who like these phrases or use them at all. They remind us of our little ones, gone too soon, and they remind us that we figured out they were gone because they had slowed down. I will say it’s true that I wish time could slow down. I try hard to soak in all the little things, and the big things too. I feel as though I already can’t remember what he was like when he was born…how will it feel when he is 18? I wish no baby had to slow down. I wish no baby had to stop growing. I wish no mama had to experience the consequences of it happening to their child. Sweet Leo, please continue to grow big and strong. Brave and kind. And Time, be gentle on me. It’s me. Your mom. It’s been a while since I have written. I’m sitting here in our Virginia house, snuggling your little brother on the kitchen floor while we have our carpets cleaned. I’m not really sure what to say right now, but I know there is something in here to tell you. First off, we are moving. We are moving home to PA, close to family. We miss them and want Leo to know them, like we know our grandparents. I wonder, if your arrival had been different, would we have moved back to PA sooner? Would we still be here, listening to the whir of the carpet cleaner, you playing next to me while Leo sleeps? I needed to tell you we are moving because somehow I feel like leaving this home is like leaving you. Somehow leaving here, though you are not here, feels like leaving you behind. All of my memories of you are here. Finding out you were on your way just as we bought this house. Immediately planning the nursery once we moved in, but having it come to an abrupt and heartbreaking stop. A birthday with you in this house. A Thanksgiving with you in this house. An annual tree decorating party with you in this house. You were here. And after you died, this was still your home. We planted your winterberry out back and we celebrated what should have been your due date. I slept on the floor in the nursery because it made me feel closer to you. We celebrated two of your birthdays here and created Joanna’s Gifts boxes in your memory for other loss families. We ate cupcakes and released sky lanterns. We sent you a balloon on Pregnancy and Infant Loss Awareness Day last October. Then, we found out Leo was coming. This baby promised to us, our rainbow, was on his way. And we began working on the nursery again. The one that was gender neutral, the one that was for you. And now for him. Together. A place you share, a place you both physically exist. And now we are leaving–you will never physically share a space with your brother again. We will move into a new home and he will get a new room, maybe dinosaurs or superheroes. And you will not share it, or get your own new room. We will take all the pieces of the nursery and create a similar space, continuing the elephant theme. 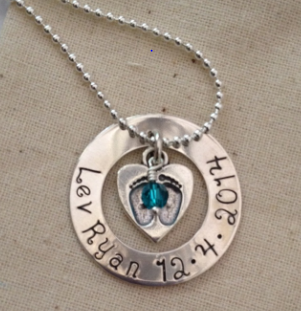 We will still hang your footprint and handprint with Leo’s and any other baby who comes along. And though pieces of you will be in the room, you won’t have had a physical presence. We will take your winterberry. Your memory boxes and ashes are already awaiting us in PA at Gramma and Grampa’s house. That’s where to find us. I guess just as you are physically gone, so we will be gone from this place as well. But we do know you are in our hearts. You are ours forever. You are our firstborn and we will see you again someday. Last night I rocked your brother for the last time in the nursery. It was hard, but also I was thankful knowing I would rock him and put him to bed for many, many more nights. I so miss that I couldn’t do that with you. Today I looked into the empty nursery and all I saw were walls painted with so much love, but I also saw the dreams that were dashed when you left. I feel blessed to have your brother to dream with. Tomorrow we will leave. Our first house. Your first house. But your new home is the best of homes…the home where Jesus holds you until we can wrap our arms around you again. We just wish you could be with us now. Sweet girl. Until we see you again, sending so much love heavenward. I’m sorry that it has been so long since I have written to you. It’s not because I don’t miss you, because I do, every minute of every day. But lately I have been spending a lot of time cuddling your sweet baby brother and not a lot of time on my computer. Two years ago today I found out you were on your way. One year ago tomorrow, I went to a concert and I heard that still small voice in my heart assuring me that there would be more children, that you were not meant to be an only child. Today, you are a big sister. Tonight, your brother is sleeping soundly on your daddy’s chest, and right now, I wish you were here more than ever. With each snuggle, snore, dirty diaper, cry and feeding of your baby brother, I wish I’d had that time with you when you were born. Leo is the sweetest, and he fills my heart with so much joy, but even as full as my heart is now, it is still broken. Broken that you have been gone almost 19 months. Broken that I never got to wake in the middle of the night and listen so closely to hear you breathing. Broken that I never got to feed you, dress you, look into your eyes, take you to the pediatrician, see you grow and change. How can my heart be so complete and so broken at once? Yet, I should tell you, sweet girl, that even though my heart is broken, even though our rainbow baby is here, my heart wouldn’t be complete without you. I would never trade you. I would never wish to have not gone through what we did together – your life and death and your presence in my heart. I cherish it all and I love you more each day, as I miss you more each day. I love you so much, Joanna. Hi, everyone. Just a little change for the week. I invited my friend Polina to write a letter, and so today’s post is written by her. She and her husband Joel lost their son Lev Ryan, affectionately known as Lentil. Like Joanna, Lentil entered the world silently in December 2014 at 33w3d. Bill and I met Polina and Joel at our MIS support group. Without further ado, here is Polina’s letter to Lentil. Two months ago your Daddy and I went to see Scott Bradley and Postmodern Jukebox (PMJ) in concert. Back in September, your Dad introduced me to this band on YouTube. They take modern pop-music and turn it into more classic music styles (jazz, blues, 20’s, 30’s, 40’s styles, and many more). I remember that was the week when we read that you could hear us, hear music and different beats and we should play music for you. When your Dad started playing their songs, you liked it so much that we could feel you kicking and enjoying it. We played them for you several times, and you definitely were very fond of PMJ since you always let us know by kicking with the music. Last November, a few weeks before we lost you, I went to see “Fiddler on the Roof” and I felt you inside bopping along with the music. I came home and told your Dad that you are going to love live theater and have a good musical ear just like I do. It was very good to see your Dad having a great time and enjoying the concert so much. I loved hearing him laugh when he would recognize the song that the PMJ was about to play. I haven’t seen your Daddy so happy in a long while. I felt happy in that moment as well, there was truly phenomenal singing and dancing. However, after we left the concert, we felt really sad and missed you even more. The last time we heard this band, there were 3 of us, and you enjoyed the music as much as we did. Our little boy, today is exactly one year since we found out that you were a boy. I asked the nurse to place the paper with your gender into an envelope and seal it, as I wanted to find out at the same time as your Dad. We opened the envelope at the same restaurant where we had our first date. Then we called our parents to share the news with them. It was a very special moment – one I will never forget. We were so looking forward to meeting you, and all we wanted was for you to be healthy and happy. I often get so angry that we won’t get to experience all the things with you. We’ll never see your first smile, never see your first step, never see you run in our new house which seems very empty and sad right now, and we’ll miss so many other firsts that we were robbed of. Most of all, I get so sad thinking that YOU won’t get to experience those things. Sign Up For New Post Alerts!